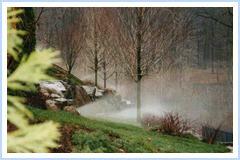 Northern Irrigation is an owner supervised and family run business. We design and performs all installations and will work within your budget. No job is too small or too large. We repair all systems and all brands. Any system can be altered or expanded. Northern Irrigation will design for full head-to-head coverage for your lawn. Many companies design for tip-to-tip coverage, which will help them save on parts and make the price lower for the customer. However, head-to-head coverage is the only design that will prevent any brown spots on your lawn by providing an even distribution of water across lawns or shrubs. 1) Will the installation of lawn sprinklers destroy my lawn? No. 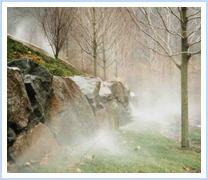 Northern Irrigation uses a professional machine that creates slices carefully through the lawn. We dig shrub beds by hand. What little disturbance that does occur is tamped down by hand and reseeded. 2) I have a well. Can I still have lawn sprinklers? Yes. Every house is different. We design systems around the pressure and volume output of each individual well. We set timers to provide the proper schedules for watering your lawn. 3) Can I just have my shrub beds irrigated? 4) My budget allows for only part of my property to be done. Can I do half now and half later? Yes. We work within all budgets. Let us light up your nights! Why only appreciate your landscaping during the day? Enjoy your landscape investments all night long, as well as year-round. We will design a lighting system that will make your home stand out. We offer full landscape lighting services, from lighting for paths or patios, to full-house lighting. You'll love how your home and landscaping look at night.